Samsung has finally broken the news that many smartphone owners out there have been waiting for. The South Korean company may be gearing up for a Galaxy S7 and S7 Edge reveal later this month at its Unpacked 2016 event, but it seems there’s some good news on the horizon for owners of the company’s older hardware. The company has officially confirmed that Android Marshmallow 6.0 is rolling out globally today for the Galaxy S6 and Galaxy S6 Edge, putting an end to the constant questioning about when, or even if, it will be offered to those models. The official introduction of Android Marshmallow 6.0 for the Galaxy S6 and S6 Edge may be enough to please most users, but there’s a little bit more. As part of the announcement, Samsung has let users know that the update will start rolling out today as an over-the-air update for those particular models. That said, those in possession of carrier locked devices may have to wait a little longer than those with international unlocked devices for the update to appear, as has been the trend over the years. Since Samsung uses its own custom version of Android, TouchWiz UI, the firmware update brings in some serious enhancements to the edge panel functionality of the S6 Edge. As part of the update, the edge screen has been widened to 550 pixels from 260 pixels, which means more information and content can now be displayed on the edge panel. 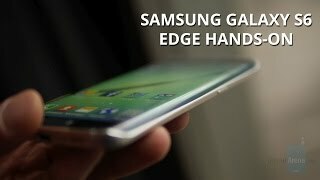 Samsung says that “This upgrade has also allowed for the addition of new features, as well as improvements of existing ones.” To break it down, the enhancement has been applied to: People edge, Apps edge, Quick tools, as well as the Edge handle which can now be customized by location, size, and transparency. Of course there are also a host of additional interface and usability tweaks that have been integrated into Android Marshmallow 6.0 to make your S6 and S6 experience a totally fresh one. Samsung has also announced that a slew of other Galaxy devices deemed compatible with Android Marshmallow will also be benefiting from the update sooner rather than later. However, Samsung has not declared which devices it’s talking about, and has instead chosen to make individual announcements for each device type when the update is made available.